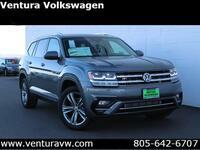 Drivers near Ventura, CA looking for the perfect full-size SUV for all of their adventures are in luck with the new 2018 Volkswagen Atlas from Ventura Volkswagen! The new Atlas offers drivers a bold and athletic exterior design with multiple engine options, an impressive amount of both cargo and passenger space, impressive capability and a host of standard and available advanced safety technology! The new VW Atlas is available in multiple trim levels and offers FWD and 4MOTION® all-wheel-drive configurations. Keep reading to learn more about the 2018 Volkswagen Atlas from Ventura Volkswagen! The base model of the 2018 VW Atlas (S trim) comes fitted with a 235-hp, 2.0-liter turbocharged FSI four-cylinder engine and offers seating for seven passengers thanks to a total passenger volume of 153.7 cubic feet. Don't need seating for all of those passengers? The Atlas offers up to 96.8 cubic feet of cargo volume with the second- and third-row seats folded down. The Atlas S offers an impressive 24 combined miles per gallon! All models of the Atlas include a 6.5-inch color touchscreen infotainment system, Volkswagen Car-Net® App-Connect, Bluetooth® technology with audio streaming for compatible devices, Intelligent Crash Response System, a rearview camera system and more! Additionally, the 2018 VW Atlas offers an available 276-hp, 3.6-liter V6 engine for added performance. The V6 engine offers an EPA-estimated 18 city and 25 highway miles per gallon. Other impressive available features include Blind Spot Monitor with Rear Traffic Alert, Front Assist, Climatronic® three-zone climate control, second-row captain's chairs, Volkswagen Digital Cockpit and more! The 2018 Volkswagen Atlas has picked up a number of accolades the past year, including the Cars.com 'Best of 2018' award, the MotorWeek Drivers' Choice: 'Best Large Utility of 2018' award and the Good Housekeeping: 'Best Mid-Size SUV of 2018' award. Schedule a test drive of the new 2018 Volkswagen Atlas - or any new VW model - at Ventura Volkswagen today!